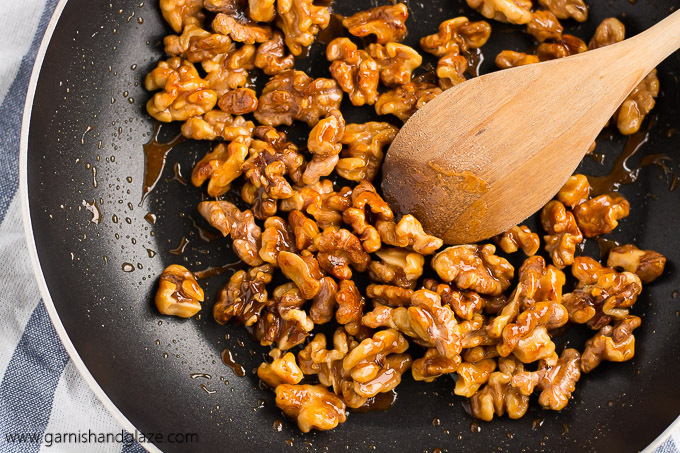 Honey Glazed Walnuts are the perfect sweet and crunchy addition to any salad. With New Year’s resolutions starting this week I’m sure a lot of salads are on the menu. Nuts are one of my favorite toppings to add to salad. If I’m lazy I just add roasted peanuts but I prefer toasted or glazed so I’ll often put forth the 10 minutes to prepare a cup of nuts for the week to add to my salads. It’ definitely worth it! 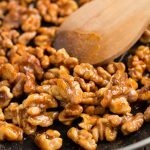 It only takes 4 ingredients and a skillet to whip up these addicting sweet and crunchy Honey Glazed Walnuts. These are especially perfect for those who are trying to limit their refined sugar intake. Try these in this Roasted Butternut Squash Salad and this Blackened Salmon Salad… or just snack on them (because you won’t be able to help yourself). Line a baking sheet with foil or parchment paper. Set aside. Melt butter over medium heat in a non-stick skillet. Mix in the honey and cinnamon and then mix in the nuts. Cook over medium heat for 5 minutes, stirring often until coated and toasted. Pour nuts onto the lined baking sheet and quickly separate the nuts using a spatula or fork. Let cool (about 5 minutes) and enjoy! These look so good! Can’t wait to make these. Thanks for sharing. Happy New Year!!!! I think I’ll be making these as part of my Game Day snacks, that’s if I don’t eat them all myself. I am going to make Dried Cherries & glazed walnuts, this recipe look soooo good! Yum! I love dried cherries and walnuts together! I made this for my salad ..I added a pinch of salt to the mix..i also added some dried cranberries to the mix while it was out cooling off and it taste delicious. I added a tiny bit of bit of kosher salt to give the taste sweet and salty., just before the cooling off time. Wonderful flavour. Quick and yummy! I used margarine and it worked very well. And I added these to a warm, quinoa breakfast bowl–cooked with soy milk like oats, and topped with strawberries. So, this recipe made a great addition! Thank you! Thank you for the recipe! How do you recommend storing these and how long do they keep? This is so simple, thank you. I love butter and anything sweet! I plan to try this and try substituting pure maple syrup for the honey. I followed the recipe to the letter and it came out very good. The only thing is I was not able to help myself and kept on snacking on them. Thank you. 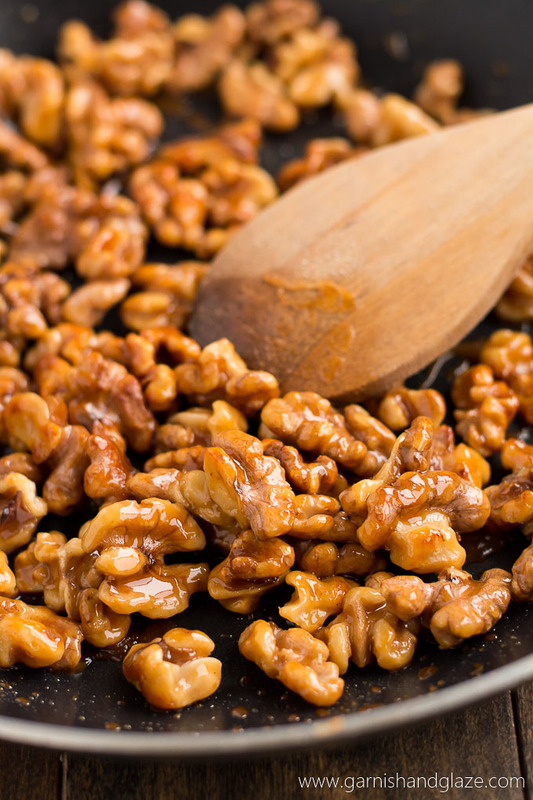 This is the recipe that came close to the glazed walnuts that I have eaten in restaurants.